Greyhounds love to run, right? So they must be high energy, high maintenance, active dogs, that need a lot of exercise, right? NO! Well, at least not all of them. 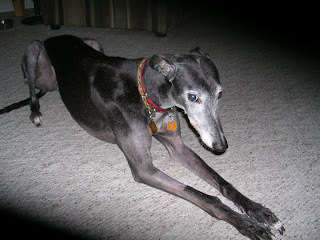 I am here to tell you that my first greyhound, Piper, was always a laid back, lazy girl. We have a fenced back yard so she did laps when she felt like it and when she didn’t, which is most of the time, she sprawls on her bed. They aren’t known as a 45mph couch potato for nothin’! My current grey, MeMe, has more pep but is by no means a wild child. Greyhounds are trained to chase a “rabbit” so they must not be good with cats and small dogs, right? NO! Just like any breed, there are greyhounds that are not cat or small dog friendly, same as a Beagle who doesn’t like cats or a Great Dane who doesn’t get along with Chihuahuas. Both of my greyhounds have lived very peacefully in the company of 4 cats. Greyhounds are big dogs so they must eat a lot, right? Again, nope! Greyhounds are built to be lean, some say skinny, so they do not require a lot of food. With a fenced yard or a couple of good walks a day, your grey will stay svelte as long as you don’t over feed him. A high quality grain-free dog food or raw diets, like MeMe eats, are recommended. The ex-racing greyhound has spent its entire life living in a cage just big enough for him to stand up and turn around in. He has never seen stairs, mirrors, sliding glass doors or walked on tile floors. He’s never had the luxury of sleeping on a comfy bed or cushy couch. He hasn’t experienced hugs, kisses, belly or ear rubs. He doesn’t know that counter surfing is a no-no; he hasn’t been around small children, cats or small dogs. All he knows is he is looking for his forever home. His needs are basic – good food, fresh water, a nice comfy bed to sleep on (greys have very little body fat, about half that of a different breed dog of the same size, so they have less “cushion” to sleep on hard floors), a few toys, some basic household training (teaching him how to go up and down stairs; that glass is not invisible – we have decals on our sliding glass door, our MeMe will try to run through it; that mirrors are NOT a strange dog in the house) and lots of love. Isn’t that what we all deserve? Thank you for this insightful article on greyhounds. It would be wonderful if all ex-racing greyhounds were able to find their forever homes, but sadly this is far from the case due to overbreeding by those involved in the racing industry.